The 2009 Mercedes Benz SLR Stirling Moss is the perfect example of a car that fits Show or Display. 75 cars produced, more power lighter weight than a standard SLR. Technologically significant. If you don't know who Stirling Moss is, then you should look him up. The car is very unique, very expensive, and probably not something that would ever get more than about 2,500 miles in a year. "The SLR Stirling Moss is a limited edition (75 vehicles) of the series, which uses a speedster styling that does not include roof or windscreen. The design is inspired by the 300 SLR race car, and was by Korean designer Yoon Il-hun. It was to be the last series of the McLaren SLR built under the partnership between Mercedes-Benz and McLaren, until McLaren announced their own final edition of the SLR in late 2010. The supercharged V8 engine is rated 650 PS (480 kW; 640 hp). The car's top speed is 350 km/h (220 mph) with acceleration from 0–100 km/h in less than 3.5 seconds. The car is approximately 200 kg (440 lb) lighter than the regular model. 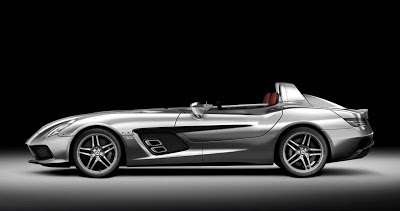 The SLR Stirling Moss began production in June 2009, after SLR Roadster's production ended in May 2009. All 75 cars were produced by December 2009. 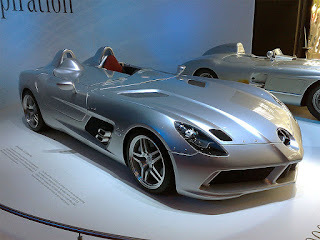 The SLR Stirling Moss has MSRP of €750,000 and was available only to SLR owners."